For working parents, the cost of childcare can be overwhelming. If you work shift or have to be at the office early, it's often hard to find someone to look after your children before school as well as after school. That's why breakfast and after-school clubs can be so helpful. Paying for either club is easier than you might think, as they are subsidised by the government and so are cheaper than other forms of childcare would be. A breakfast club place can cost from £1 to £3 every morning, while after-school clubs can be as little as £3 per afternoon, depending on area. Be warned, however, that there are often long waiting lists, although in exceptional cases children may be able to jump the queue. If you need help paying for a place at a breakfast or after-school club, ask at your children's school. You may be eligible for a free or discounted place, depending on your situation. Breakfast clubs are usually run by schools, and provide a safe setting in which your child can eat breakfast and participate in supervised activities, which often revolve around homework. Children usually eat together around a table and the club provides a healthy breakfast, which usually consists of cereals, juice, fruit, toast etc. For the most part, breakfast clubs are for children of parents who have to be at work before school begins in the morning. However, they can be used by children in any circumstance, including those who would not get access to a wholesome breakfast otherwise. What is an After-School Club? 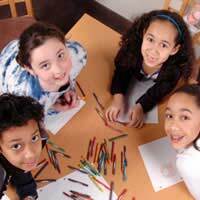 An after-school club is a place where children can be looked after when the school day is over, usually until 6pm. After-school clubs are usually located on the premises of a school, although sometimes they are held elsewhere. Often, children will be escorted by qualified playscheme workers from their school to the club, if located in a different area or at a different school. After-school clubs are usually for primary school-age children. They are provided with healthy snacks and take part in fun activities, including games, sports, arts and crafts etc. In some cases, they can also get help with their homework at the club. Breakfast clubs and after-school clubs provide working parents with the security of knowing their children are being looked after at a reasonable cost. Ask at your children's school to see what exists in your area. Help with breakfast payments, after school. Both parents work.